::ROBERT'S EDIT:: Check out the post above for a discussion about the correct ID for this bird! Migration is really heating up around here, but I can’t fully enjoy it. I’ve been stuck in the work routine recently, which means my birding (and by extension, blogging) time is limited - something I'm trying to work on getting more of! Today, for example, I had a free afternoon, so I decided to visit Few’s Ford on the Eno to see if I could drum up any of the Empids that’ve been reported recently. As soon as I stepped out of my car, I heard an odd clucking reminiscent of a farm chicken, or a turkey with something stuck in its throat. So I pressed forward into the woods to investigate. I could hear the clucking up ahead, deftly dodging spider webs and poison ivy. Twenty feet in, however, the sound changed direction – it was coming from my right, no, wait, behind me! So I raced back to the parking lot, and the clucking again retreated into the woods. By this time I had my suspicions about this bird, but I had to see it to confirm. Finally, the sound stopped moving, and I could hear it just above my head, at the top of a tree. I ran to the parking lot and there it was. Honestly, not a bird I thought I'd ever photograph. And certainly not in the Triangle! A Black-billed Cuckoo! Actually there were two of them, doing a little call and response routine from the woods. But this is the only one that showed for pics. It’s a great bird anywhere in the state, but in the Triangle it’s pretty phenomenal. How phenomenal? 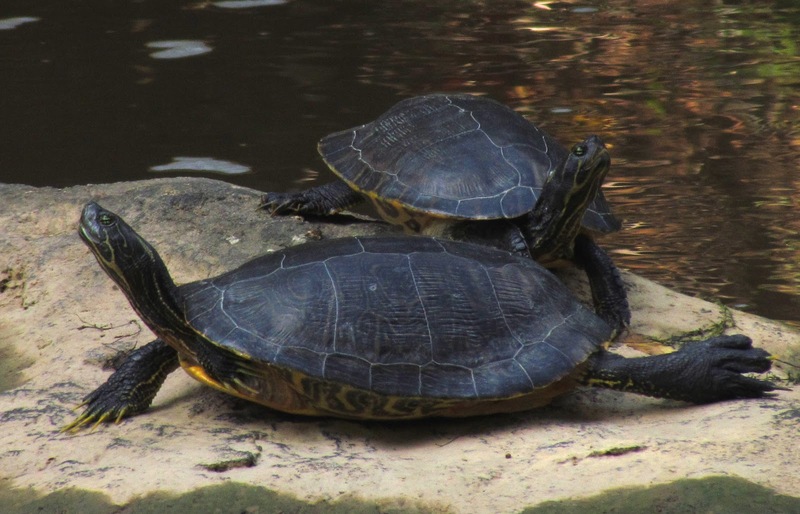 Well, I've actually seen them once before, on the 17 Acre Woods greenway in Durham. But most of my birding friends have never seen one! Immediately, I texted all the birders I could think of, but half of them were going out of town and one of them already “had” the bird on his state list by way of Nocturnal Flight Calls (you know who you are). But Nate Swick of The Drinking Bird needed it as a lifer, and raced over to check them out. what was that last one... oh yeah, the black bill! The bird flew from its perch well before Nate showed up, but the birds were still vocalizing. Eventually we found it again, foraging between the leaves of a sweet gum (or was it a sycamore? Note to self: learn trees better). We noted how different it was from the more common Yellow-billed Cuckoos: smaller, leaner, with a tiny bill that stuck out like a thorn. Even the way it foraged was different, deftly flitting about, almost like a large warbler. In exchange for getting him a lifer, Nate agreed to show me where he’d seen a couple Empid flycatchers a couple days earlier. If the flycatchers were there, they weren’t vocalizing at this time of day, so I decided to hike back to my car along the river. 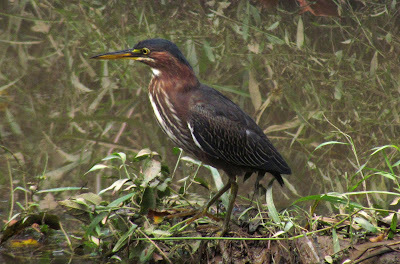 I didn’t find all that many birds, but I did flush a pair of drake Wood Ducks and this nice Green Heron. 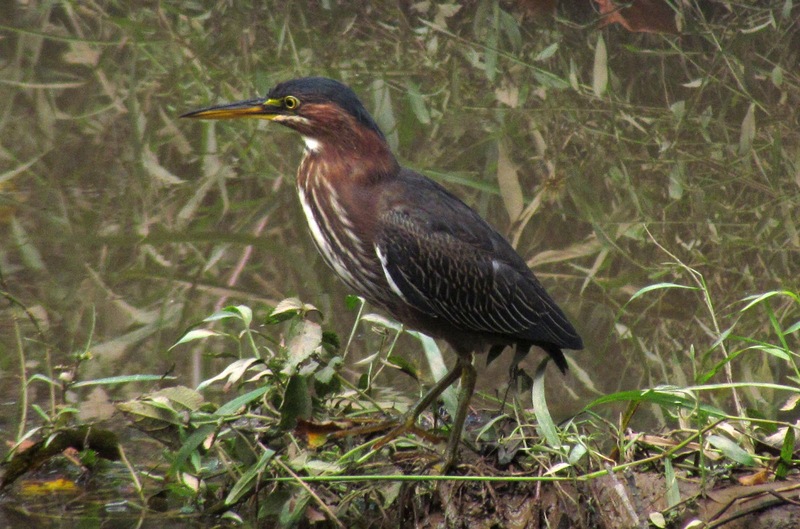 They may be common, but it's always awesome to sit there and watch a Green Heron do his thing. I braved overgrown trails and patches of mud, and soon lamented the effort I was giving when there weren’t birds to be found. Just as I was about to give up, I heard chickadees up ahead, and soon found a large flock flying back and forth across the river. 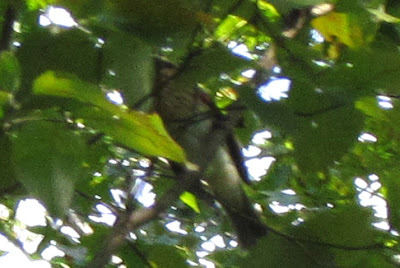 Flitting between the common birds were the warblers that make a birder’s day worth it – Tennessees, Redstarts, and Black-throated Green Warblers actively foraged, often obscured by thick foliage. I enjoyed a nice Black-and-White Warbler that made his way up a trunk not ten feet away. But in my enjoyment I forgot to take pictures, so you’ll have to make do with what is probably the biggest River Cooter I’ve ever seen. To put it into perspective, the turtle in back was a good foot or so long. Down the trail, I heard an odd spink! That’s how I’d describe it – loud, sharp and metallic. Like a Northern Waterthrush chip-note on steroids. Then I realized I’d heard the sound once before, when I was in Ornithology class. We were on a bird walk around Beaver Lake when our professor pointed out a black bird vocalizing from the top of a tree. It flew off, and I could see bright crimson on its chest and armpits. The memory finished replaying in my head and I ran after the sound, because this Rose-breasted Grosbeak would be a photo-lifer for me. I'll take what I can get, yeah I'll take what I can get... but you ain't seen nothing yet! ... actually that was my last picture of the day. Sorry! I found the bird almost instantly, but much to my chagrin it was a female, not the brightly-colored male I was looking for. Still, a photo-lifer is a photo-lifer, and I tried to get my camera to navigate the thick foliage and focus on the grosbeak. I gave up pretty easily and just took a shot of the general area around where the bird was foraging. Luckily enough, one of the shots picked up the bird you see above! I finished the loop and returned to my car. 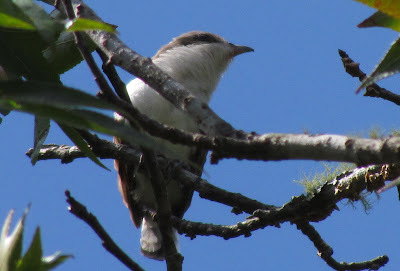 Even this late in the afternoon, I could still hear the Black-billed Cuckoos calling, albeit deeper in the woods than before. I briefly considered going in after them, but I was sweaty, muddy, and seriously wanted a shower. But it was totally worth it – I had my best day of migration all fall, and I didn’t even have to wake up early. The best kind of birding! Dude - nice finds on the BBCUs...looks like the one you snapped the pic of was/is molting it's tail, or was that just the angle of the pic? 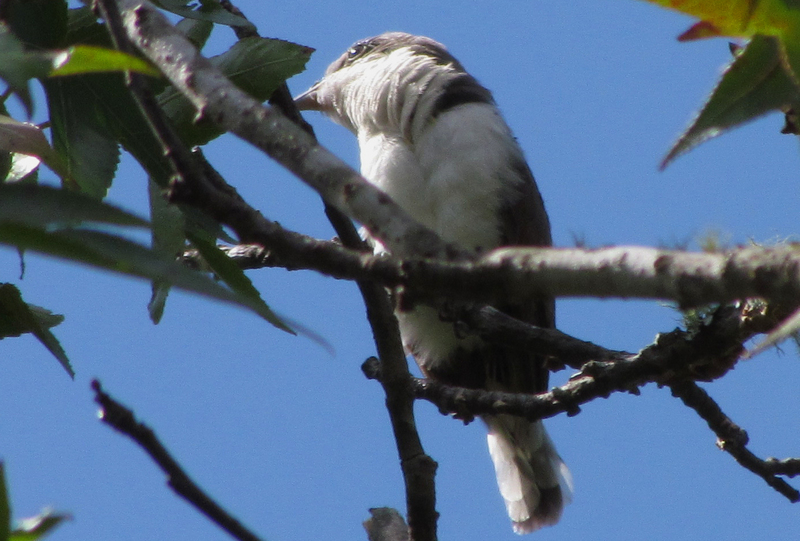 Heard that same metallic, scratchy 'spink' today as well - gotta love those grosbeaks! It's a little bit of both - the angle foreshortens it, but it definitely seems to be missing a couple tail feathers. Yeah, I was thinking the same thing. What the hell was up with its tail? ROBERT is the elder of the Birding Bros. He has been birding since 2009 and is the bird finder/identifier of the team. He is currently losing The Competition with 368 species. JAMES is the younger of the Birding Bros. He has been birding since 2010 and is the bird photographer of the team. He is currently winning The Competition with 412 species.